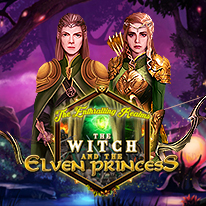 Joining Stella and friends adventures to save the elf kingdom in The Witch and The Elven Princess. On a journey to help people with her magic, a witch named Stella has traveled across the world with her companions Otto and Mia. Their journey has brought them to the borders of the elven kingdom. Eager to show her friends where she grew up, Mia convinces Stella and Otto to pay her old home a visit. However, they’re in for a terrible shock. The beautiful elven kingdom is no more. It has been attacked by a dark army and now lies in ruins. With the royal family nearly destroyed, the young Princess Aravia now sits on the throne – and she has little love for outsiders. Nevertheless, with the elves suffering and Mia’s family missing, Stella and the others vow to do what they can to help. They set out to restore the land and drive back its terrible foe. Help Stella and her friends collect the materials they need from around the elven kingdom. Use your puzzle-solving skills to match elements so Stella can work her magic!